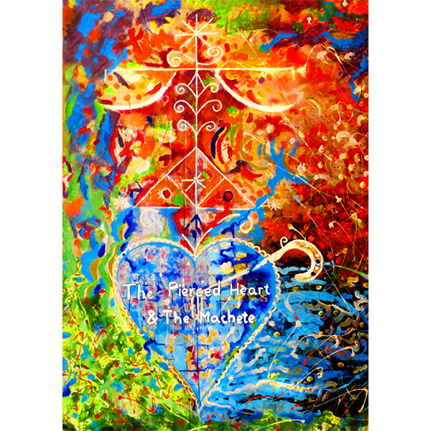 The Pierced Heart & The Machete is a vivid, unflinching exploration of two annual Vodou pilgrimages in Haiti. The first is for Èzili Danto, goddess of love, art and passion; worshipers from all over the world descend on the southwestern town of Ville-Bonheur to bathe in the sacred waterfall where Dantò resides. The second pilgrimage is for Dantòs' husband Ogoun, god of war, iron and healing. It takes place at the end of July in the northern town of Plaine du Nord, where practitioners bathe in a mud pool and make flamboyant sacrifices. This beautifully shot film offers disorienting yet illuminating glimpses of the contradictory and complementary aspects of these two lwa, the electrifying rites that honor them, and the intense music that accompanies these ecstatic and bloody ceremonies. As in her previous film for Sublime Frequencies, Staring Into the Sun, Olivia Wyatt’s vision is always sharp, unerring and unobtrusive. 70 minutes/Color; digipack; all-region DVD; NTSC format. Limited one-time edition of 1000 copies.